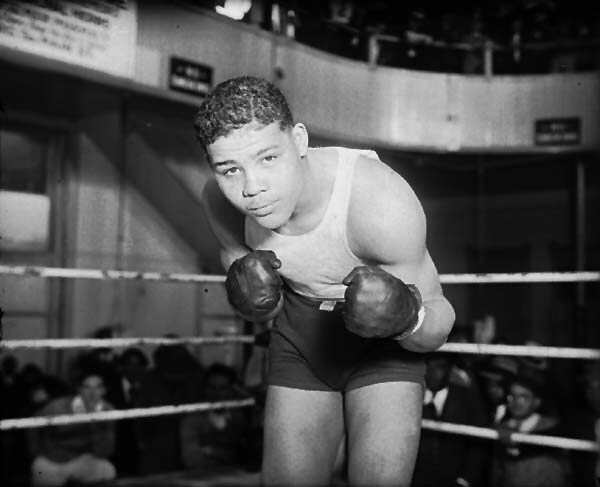 One of the most anticipated sports events of the immediate postwar era was the rematch between the reining Heavyweight Boxing Champion of the World, Joe Louis and challenger Billy Conn of Pittsburg.Joe Louis (Joseph Louis Barrow), the “Brown Bomber” made his professional boxing debut in July 1934. Louis won the title from Joe Braddock in June 1937 and defended it 17 times. before meeting “Pittsburg Kid” Billy Conn for the first time in June 1941. 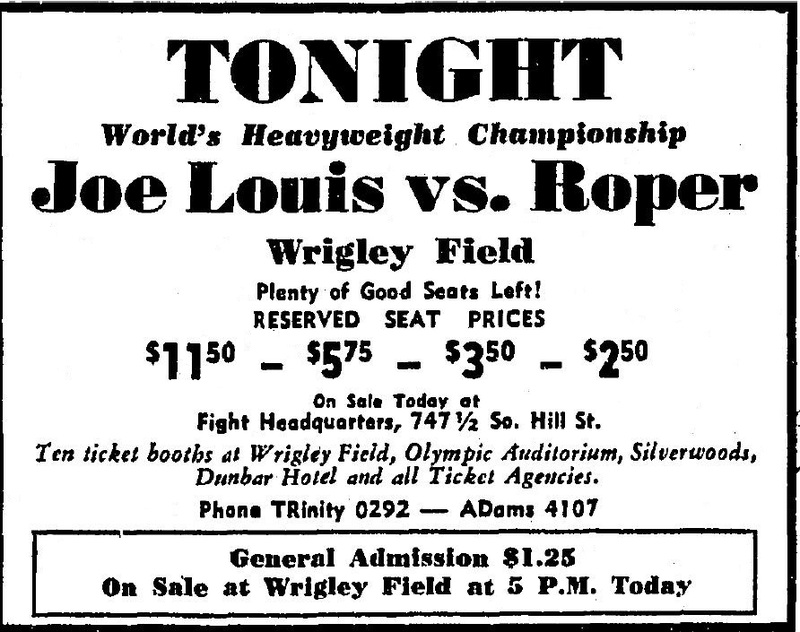 In April 1939, Los Angeles got to see Joe Louis in action live, when he defended his title against Jack Roper at Wrigley Field. Louis won by KO in the first round. Joe Louis in the ring at Main Street Gym c. 1939. Winkler Collection, Notre Dame. Like Louis, Conn entered professional boxing in 1934, and went on to become Light Heavyweight World Champion in July 1939. He gave up that title to enter the heavyweight classification, taking on Louis at New York’s Polo Grounds in June 1941. Conn nearly won the bout, which went 13 rounds and was named “fight of the year” by Ring magazine. There was immediate talk of a rematch, but it had to be postponed when Conn injured his hand in a brawl with his new father-in-law, Major League ballplayer Jimmy “Greenfield” Smith. Meanwhile Louis signed on to fight California boxer Lou Nova in September at the Polo Grounds (he won). 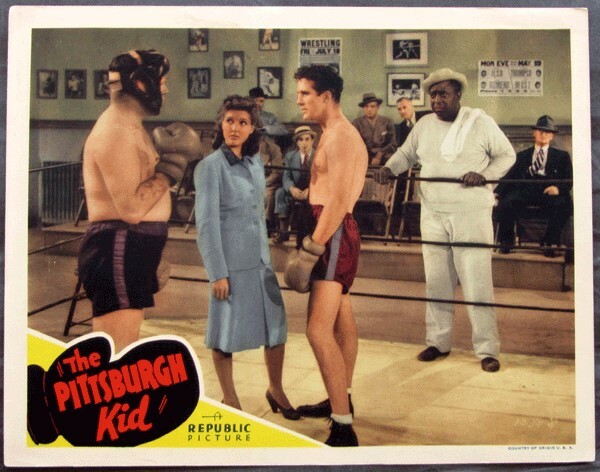 Hollywood met Billy Conn when he arrived with his bride, his manager and his trainer in July 1941 to film “The Pittsburg Kid” for Republic studios. “I should have knocked Joe Louis’ block off,” Conn told the waiting reporters before being whisked off to a press luncheon at the Biltmore. Then the U.S. entered World War II and shortly after both fighters were inducted into the Army. 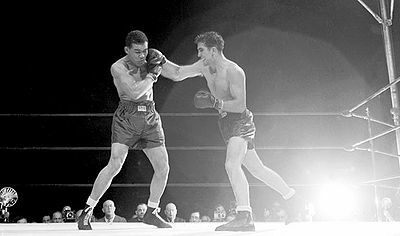 In 1942 Louis and Conn fought each other in an exhibition, but the title fight rematch would have to be put on ice for the duration. 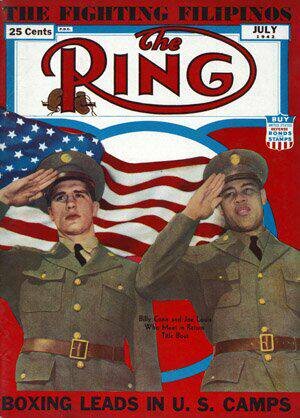 Joe Louis and Billy Conn in uniform on the cover of Ring magazine July 1942. Just a couple of soldiers. 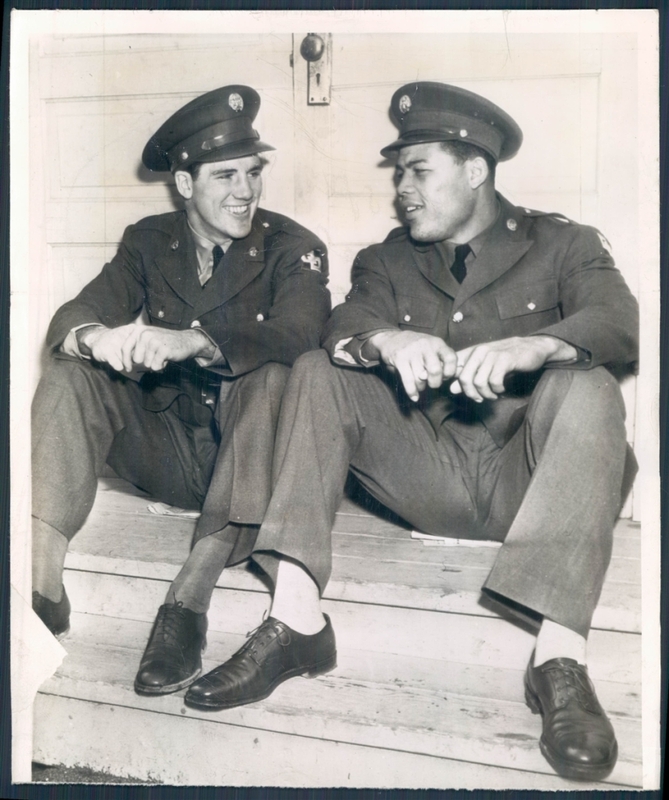 Joe Louis and Billy Conn in uniform, 1942. Before Pearl Harbor, Louis took part in exhibition matches to raise money for various war effort charities, generously donating his own earnings. 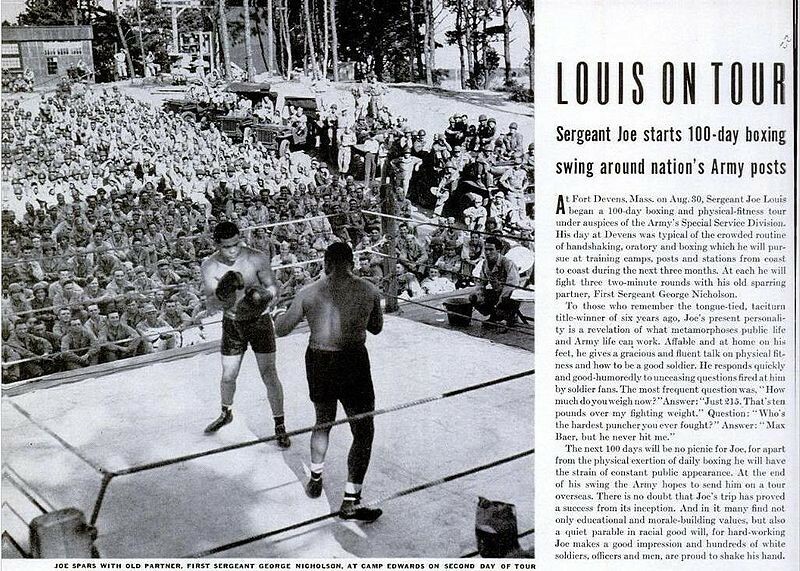 While serving with the Army’s Special Services Division, Louis began a 100-day physical fitness tour of training camps in August 1943 where he participated in sparring matches. From Life, 9-13-1943. Just two weeks after his honorable discharge in October 1945, Sgt. Louis (Barrow, really) agreed to the much-anticipated rematch with Conn, to take place June 19, 1946, five years and a day since their first battle. There was much talk that, at 32, Louis was past his prime and had been out of the professional ring too long to stage a “comeback.” Nevertheless, the Champ was easily the odds-on favorite. 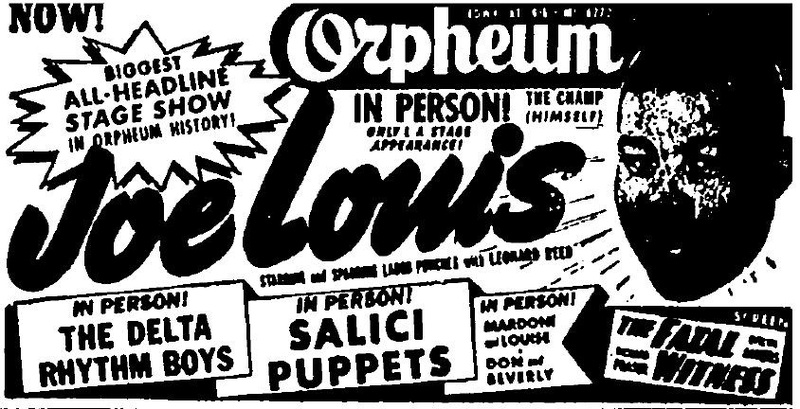 Los Angeles could see Louis in person in November 1945, when the Champ (himself) arrived for an exhibition at the Orpheum Theater. He also put in an appearance as usual at the Main Street Gym. Los Angeles almost got to host the rematch. Promoter Mike Jacobs lobbied to have it staged at the Memorial Coliseum. Although proponents of amateur athletics objected to the use of the facility for commercial purposes, the Coliseum Commission gave it the green light. But the match would ultimately be held at Yankee Stadium in New York. There was additional controversy over the use of much-needed lumber to build extra stands for the event. 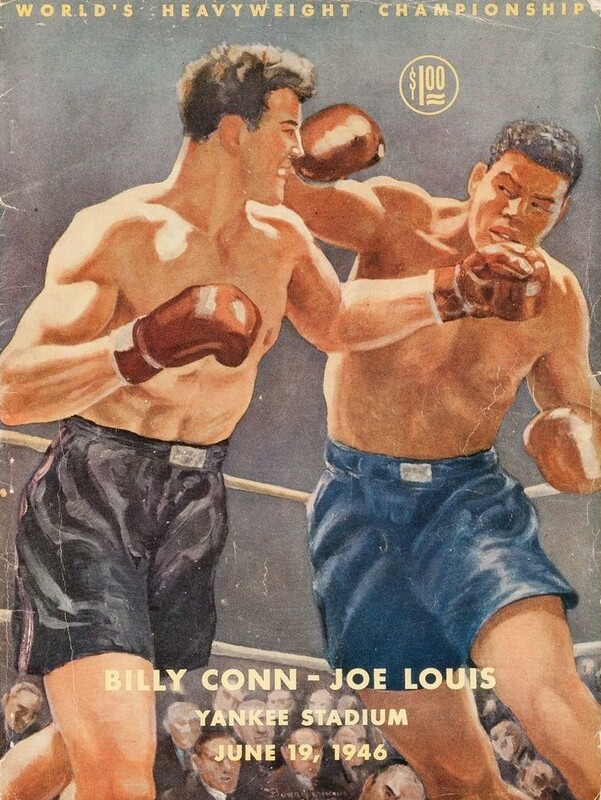 In the end, Conn wasn’t able to run or hide from Louis, who knocked him flat 2 minutes and 19 second into the eighth round and retained his title. 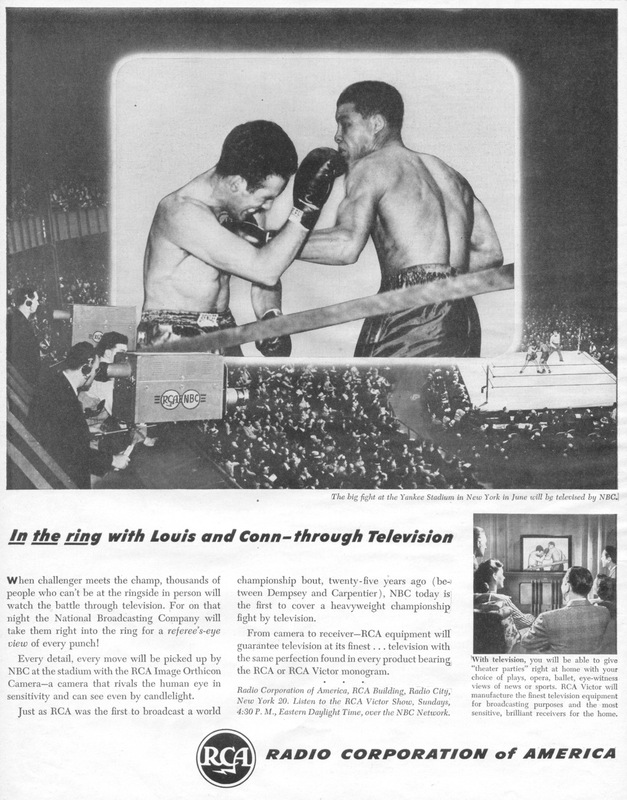 In 1921, RCA pioneered the use of radio for fight broadcasts for the Dempsey-Carpentier bout; in 1946 it broke new ground in televising the Louis-Conn rematch in some parts of the country on NBC Los Angeles could listen to the fight on the radio from ABC affiliate KECA. The two met again for an exhibition in December 1948, after which Conn hung up his gloves. Louis went on to defend his title twice more, against “Jersey Joe” Walcott in 1947 and a rematch in 1948, before vacating the title to retire in Mach 1949 as the longest-reigning Heavyweight Champion of the World to date. Financial troubles forced Louis back into the ring, however. He lost twice before retiring for good in 1951.